Delivering just as they promise, the UV1s offer all the characteristics of a single-ply head with the added durability of a double-ply. Open to a wide range of applications. These heads look and sound great. Since Chick Evans produced the first synthetic ‘weatherproof’ drum head in 1956, the company has stayed at the forefront of the development of the modern heads that we know today. Since acquiring Evans in 1995, the D’Addario company has taken on this duty of innovation and aims to take things to the next level with the release of the UV1 drum head. The unique UV1s get their name from the patented UV curing method used to coat the head. Beyond the implied, the exact details of the process are unclear, but to be fair it’s likely a pretty closely guarded secret. What Evans does claim though is that this new method gives “the most consistently applied coating ever seen on any drum head”. Interestingly, the coating does not run all the way out to the flesh hoop but instead stops just shy of the collar; so around the far edges of the head the untouched clear film can be seen. Once seated on the drum, this border line sits pretty much directly over the bearing edge and is only noticeable up close. At a glance the coating appears identical to that of a regular spray-coated head, until under closer inspection where the playing surface seems more even, thinner and much less coarse than standard coated heads. The unique UV1s get their name from the patented UV curing method used to coat the head. Not only do these new heads utilise a different coating but they are in fact also made of a new type of film, designed to offer “exceptional strength and versatility for a full range of musical applications”. 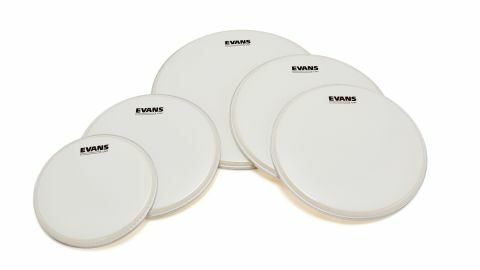 Just like a standard Evans G1 or Remo Ambassador, the UV1s are constructed from a single-ply of 10-mil film which is notoriously fragile in comparison to a thicker head. For reference, a double-ply skin like a G2 or Emperor uses two layers of 7-mil film which makes them the preferred choice for heavier hitters. For those that are interested, one mil (not to be confused with a millimetre) is a measurement defined as 1,000th of an inch. For review purposes we have received 10", 12", 13", 14" and 16" models which cover nearly the whole range of available sizes, except for 15" and 18". These sizes are perfect for putting to the test with my Tama Starclassic Bubinga (10", 12", 14" and 16" toms) plus a 13" Benny Greb signature snare. Before mounting the UV1s to the kit, we give them each a little tap with my finger out of the box. The natural tone is a low and grizzly one (even from the small 10") which bodes well for the next few hours of experimentation. Getting stuck straight into the snare drum first; with the bottom head cranked nice and tight for a snappy wire definition, we take the batter head barely past a quarter-turn before being rewarded with a super fat-back style thump. The head even feels nice to play despite the lack of tension, which is a bonus. Moving to a medium tuning, we are reminded how much of the drum’s natural tone a single-ply head brings out. Like many, we usually use thicker, more specialist snare heads with added reinforcement; not only for a dryer sound but also so they hold up for more than a couple of gigs. Moving to a medium tuning, we are reminded how much of the drum’s natural tone a single-ply head brings out. A couple of small turns to the rack toms brings them straight to life with sweet, medium-pitched tones, helped along by higher-tuned reso heads. The UV1s provide a fairly decent amount of attack without that papery slap that often comes with thicker, two-ply heads. Unsurprisingly, as we tune the toms higher, the note becomes longer yet stays snappy and articulate as we work our way into more Latin-jazz territories. Moving on to the floor toms, the sound of the 14" drum is completely transformed by the head change; effortlessly offering a resonant yet controlled rumble which has the tom sounding better than it ever has. The 16" is also suitably satisfying, producing a thunderous burst of sound with each stroke. Not only is there less ‘slap’ in the initial attack, but there is also no ‘beach-balling’ which happens all too often when tuning floor toms. We find ourself settling for lower tunings than usual to enjoy the novelty, despite the ability to tune higher. The UV1 has succeeded in offering the versatility of tuning and more open, melodic tones to the masses, whilst also delivering increased durability. They represent a definite best-of-both-worlds between the characteristics of the single-ply and double-ply head, which could be a game changer for a lot of players. Although we would have loved more time to properly road-test these heads, we can report that after hours spent playing them, they still look as good as new, and we get the feeling that these heads will be on my kit for a while to come.